Phulkari is an interactive multimedia performance involving textiles, dance, music and projected image. The goal of this interdisciplinary project was to interpret South Asian cultural identity, tradition and memory through the digital lens. Phulkari traces the life of a Punjabi style of weaving and textile production as a metaphor for one’s somatic journey through migration, displacement, and belonging. The performance mediates and interprets tradition and memory through performance technology, mapping the language of phulkari textiles onto music, movement, and projections. 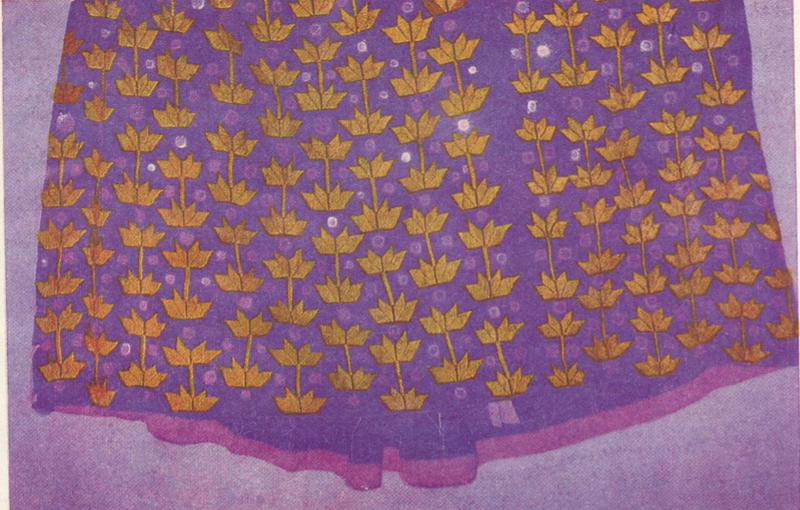 As the shawl travels from village India to Punjabi diasporic communities throughout UK and North America, its meaning shifts and is lost -- much like the traditional language and knowledge that is intertwined with it. Rather than essentializing and reifying Punjabi culture, this work treats this South Asian cultural artefact from a diasporic point of view. As such, the aesthetics draw as much from North Indian classical music and phulkari textile motifs as from contemporary dance, jazz, and electronic and electroacoustic music. This performance weaves together tradition and its continual transformation over time and space, creating a multimodal manifestation of the past, present and future. During the Summer of 2017, I travelled to Punjab in order to uncover the present meanings and memories associated with the phulkari. Prior to my trip, I contacted my extended family located in the cities of Patiala and Amritsar to see what relationship and stories they had relating to them, and if there were other women near their villages who would also be willing to share their experiences. The objective of the fieldwork was two-fold: first, I wanted to discern the meanings of the phulkari, its individual and collective meaning within Punjabi culture and what memories the cultural artefact may activate; second, I wanted to develop a photographic archive of differing phulkari designs and patterns. I had developed a set of questions which I wanted to address through informal conversations. The questions were framed based on my research on the background/history of the phulkari, which are central to gift exchange. Amrik Kaur, age 83 with a phulkari that her mother hand-embroidered and passed down to her. Photo by Conner Singh Vanderbeek. Since folk music art resists transcription, we pushed towards improvisation as the primary form for experimentation. The dancers, choreographer and I participated in naming ideas that we saw from the phulkari images and using those ideas as prompts for movement improvisations. 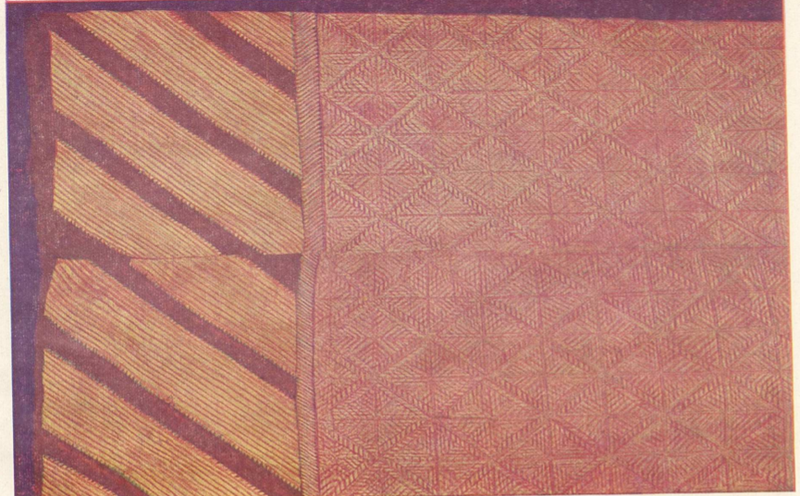 For example, prompts such as“extending beyond,” “moving in multiple directions at the same time,” and “a field”were pulled from a phulkari image. Other prompts from images were “fluidity within order”, “how does fluidity live within a static image?”, or “fluidity within structure”, and “symmetry that’s not symmetry”. We talked about the weight of the fabric, the intricate weaving that created a sense of veins, networks, connections, and motifs that looked like leaves. This translated into exploring touch, or connection through touch, gesturing toward touch, and sharing weight. We continued to experiment for several rehearsals with improvisational ideas brought forth through the phulkari images. Throughout the process, reflections from dancer’s experience with the improvisations also continued to evolve and add depth to the process. After improvisational exercises we would debrief with the dancers and ask what experiences were felt, connections made, and if disconnections occurred. This shared embodied experience combined with our outside eyes was taken together to make decisions on what direction to move toward. The phulkaris were analyzed in the same way in the dance rehearsals. For the musicians, the pieces showed the importance of asymmetrical repetition and strong, geometric gestures as central guiding principles for composition. We started improvising using these characteristics during our early meetings. We would come up with improvisatory frameworks derived from the phulkari patterns and the migration narrative of each movement. Compositional materials would emerge from these frameworks which became set material for the work. The construction of visual content started by simple manipulations of phulkari images using Adobe Illustrator and Photoshop. A manipulation that was primarily striking was the result of using the image tracing feature. The result created a vector file which transformed the more pronounced threads of the phulkari into black outlines, and the rest to a white background. The piece incorporated the use of Microsoft’s Kinect motion-sensing device to track movements of the dancers. The motion data captured from the device was used to drive generative real-time visualizations that were projected onto the cyclorama behind the performers. I decided to use Kinect tracking for the visuals because of the visceral themes of the work. 2. Averaging the dancer’s positions collectively in the space, and using these numbers to control the visuals (Emphasized in Movement 1 and 5). Due to these two types of interactions, two Kinects and computers were required for the workflow.I started experimenting with the Kinect’s depth imaging and joint tracking to see how these interaction types could manifest. TouchDesigner visual software was employed to create and integrate the interactions. Two computers were used for this production in order to process data from two Kinects. The computers (1. Central, 2. Intel NUC) were connected via Ethernet and communicated via Open Sound Control. The two Kinects tracked one of the interaction frameworks: 1) single dancer, and 2) the average combination of the dancer’s position in space. 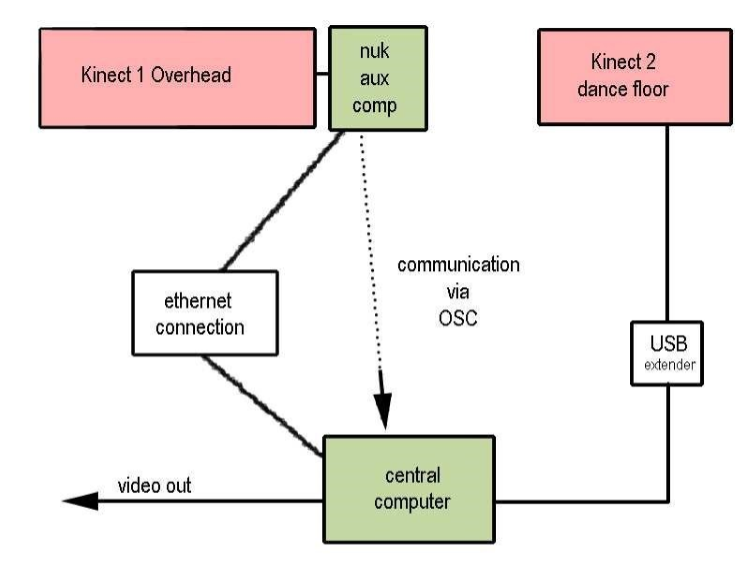 One Kinect hung approximately 20ft above the middle of the dance floor on the grid and was used to detect the second interaction framework. Carlos Garcia’s “Floor Tracker” TouchDesigner module was used to achieve this. This module reads positional data through blob tracking; by determining shapes within an image and then recording the positional changes of them. A small Intel NUC computer accompanied this Kinect on the grid which sent the corresponding blob data to the central computer. A second Kinect was placed upstage facing the dance floor. The central computer was located next to the musicians with its display located next to the lighting control towards the back of the studio. The central computer was able to remote connect into the NUC computer via the Team Viewer application.